A pastry made with sour cream and a little butter. Rolled around a filling of walnuts and a paste of flour, sugar and oh yes another bit of butter. Actually, there's more than a little butter in this pastry, but then again a pastry is to enjoy and share right? My walnut cracking helpers were all occupied elsewhere and I stopped at 50 grams (my hands can't handle a lot of cracking) and I added fresh pear cubes to the amount needed. Flavoured with lemon zest and vanilla because I was out of cardamom. I could have upped the flavors because I really liked the bits filled with walnut and the pear was just too insignificant in flavor to help in that area, it did provide a nice texture though. I didn't know that these could be so more-ish! Fresh out of the oven they were absolutely delicious, so make sure to reheat in the oven when presenting these. Dough: If using active dry yeast, add to the sour cream and stir in. Set aside for 10 minutes. If using instant yeast, add to flour. Combine flour, salt and butter and blend with your fingers until crumbly. Add egg, oil, lemon juice, and sour cream and mix until incorporated. Knead the dough on a floured surface for 5 minutes, or until no longer sticky. Add more flour if necessary. (I did end up adding another 60g flour). Form into a ball, and to follow tradition, mark with a +, symbolizing a cross. Cover with plastic wrap and refrigerate 5 hours, or overnight. Cut each roll into 6 pieces and arrange on 2 parchment lined cookie sheets. Brush liberally with the egg glaze. Bake for 30-35 minutes, or until golden brown. Excellent with coffee or hot tea. Not too sweet, just sweet enough! 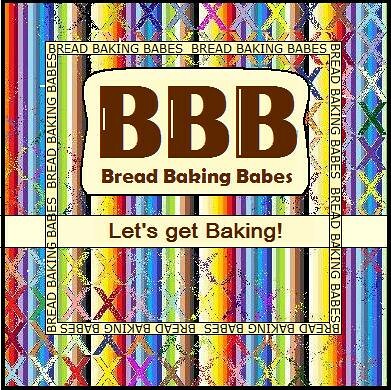 We would love for you to bake along with us! 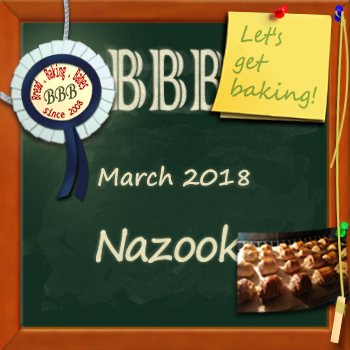 Just bake your version of this bread by March 30th and send Kelly a note with your results and a picture or link to your post at eleyana(AT)aol(DOT)com with Buddy Bread in the subject line and you will be included in our buddy round up at the beginning of next month. You'll also get your Buddy badge graphic to keep and/or add to your post. You don't have to have a blog to participate, a picture is fine! These really do taste moreish, don't they? What a terrific idea to add pears to the filling! Yum! This one looks well worth the effort! These look gorgeous. I love your additions! Fortunately I had shelled walnuts in the freezer! Oh my, having to crack all the walnuts by hand! I am very spoiled having so many shelled options readily available. I love the idea of lemon zest! I adore lemon and it would add a bit of zing to the flavor profile of the filling. Pears, yes I thought of trying some fruit, wanted to, now I have to. Yes the walnuts are terrific in these. Love that "actually there's more than a little bit of butter"! and then some ... but tasting makes it all A-OK. Without cracking helpers? were you also without those eating helpers? I need eating helpers, maybe I should advertise but Gorn doesn't want me to give any away. Do you think these would make cinnamon rolls, be less breadie than traditional cinnamon rolls and so more healthy? ;-) haha just a little more butter right. But I was thinking to put dried blueberries in with brown sugar, cinnamon and ... more butter ... more healthy. Walnuts and pears - what a great combination! And butter is good, so more butter must be better, right? Thank you for sharing this yummy recipe! I will try to cook this at home.